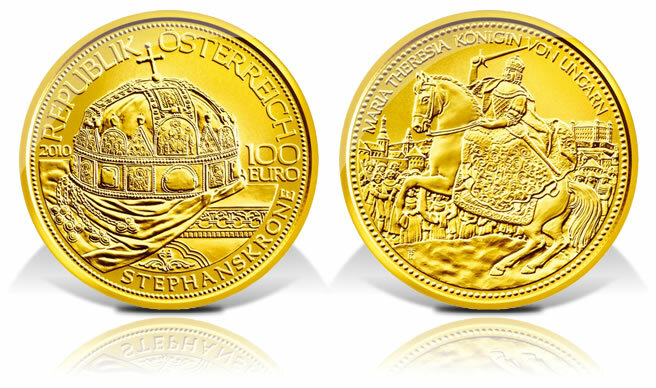 The third coin in the gold series "Crowns of the House of Habsburg" was issued by the Austrian Mint on 10th November, 2010, and is dedicated to the Hungarian crown: the Holy Crown of St. Stephen. Austria 2010 Holy Crown of St. Stephen Gold Coin. The obverse of the gold coin portrays the Holy Crown of St. Stephen. The reverse shows Maria Theresa on horseback following her coronation as ‘King’ in 1741 in Pressburg (Bratislava). The king was required to ride up the Royal Hill in full coronation regalia and there to swing the sword in all four points of the compass, pledging to defend the borders of the Kingdom of St. Stephen. In the background is the castle that still dominates Bratislava to this day. Stephen (969/975 – 1038) was the first Christian King of Hungary. He was responsible for converting the kingdom to Christianity, sometimes even through force. Around the year 1000 his ambassadors approached Pope Sylvester II in Rome for the papal blessing and a crown for Stephen’s pending coronation on 1st January, 1001. The pope acquiesced, sending Stephen a crown and the title of "apostolic majesty" since his kingship had been confirmed by the Apostolic See. It is fairly certain that nothing remains of this original papal crown. The present well-known crown has been put together from two parts. The lower circular crown (the "Greek crown") was a gift from the Byzantine emperor, Michael Ducas VII (1071-1078), to King Geza I of Hungary (1074-1077). Both monarchs are depicted in the enamel panels that decorate the coronet. The so-called "Latin crown" is formed by the two intersecting arches of the present crown. They too are decorated with enamel panels depicting Christ and the apostles. The fact that four of the twelve apostles are missing is a clear indication that the arches were shortened to fit the crown. They may have been part of a book of the gospels given to St. Stephen, perhaps by the western emperor, Otto III. One of the most peculiar features of the crown is the bent cross on its top. It has been fastened to the centre of the panel with Christ upon the throne, another indication that the Latin crown was improvised from some other revered object. There are many stories about how the cross came to be bent to one side. The most prevalent relate to its damage by a thief, but the most probable is that it was bent by the heavy lid of the case in which the crown was kept — which may explain why the cross was never straightened again. During the revolution of 1848/49 the crown was buried to prevent it falling into the hands of the Austrian emperor. It was later recovered and Franz Joseph was crowned with it in 1867 in Budapest. The last Hungarian coronation was that of the Emperor Karl in December, 1916. At the end of World War II the Hungarian crown was smuggled westward and hidden in Austria to prevent it falling into the hands of the communists. The Americans took it to the U.S.A. where it was stored in Fort Knox until President Jimmy Carter returned it to Hungary in 1977. Today it is displayed in state in the parliament building in Budapest, with its own guard of honour. 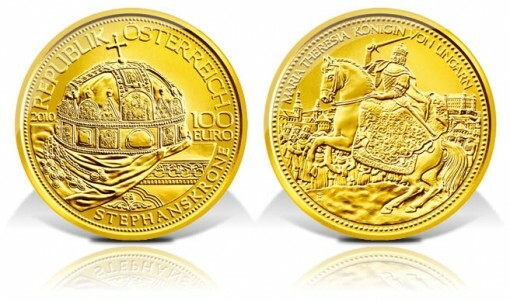 The new gold coin with a face value of 100 Euro portrays the Holy Crown of St. Stephen on the obverse side. The reverse shows Maria Theresa on horseback following her coronation as "King" in 1741 in Pressburg (Bratislava). The king was required to ride up the Royal Hill in full coronation regalia and there to swing the sword in all four points of the compass, pledging to defend the borders of the Kingdom of St. Stephen. In the background is the castle that still dominates Bratislava to this day. The €100 coin is produced in 986 fine gold exclusively in proof quality and to a maximum mintage of 30,000 pieces. Each coin comes in an attractive box with a numbered certificate of authenticity as well as a replica lapel pin. A prestigious collection case for the whole series of six coins may be purchased separately. In 2011 the series will continue with the Bohemian Crown of St. Wenceslas, kept today in St. Vitus’s Cathedral in Prague. The Austrian Mint is situated in the heart of Vienna and is the official minting authority for Austria with a 800 year history. The Mint is the source for all Austrian Euro and Cent coins, whether they are intended for shopping, as an investment or for collection. Before the Euro, the Schilling and Groschen coins were minted, and before that — during the monarchy — Crowns, Guilders and Ducats were struck by the Austrian Mint. The company is located close to the centre at the Vienna Stadtpark in a Biedermeier building erected under Emperor Ferd. There is a lot of historical nonsense in this description. Shameful, however for Hungarians( yes, where are you guys protesting? ), that the archenemy of Hungary is bringing out a coin picturing a crown they had stolen! These Austrians are proud of being thieves? What a world!